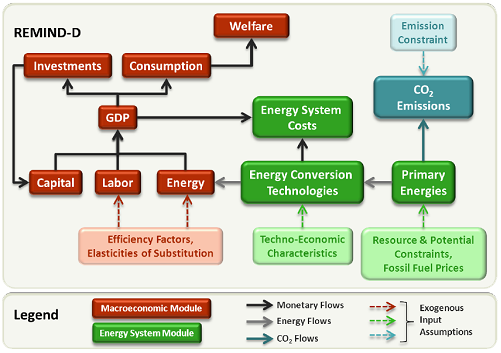 The choice of energy model is an important methodological choice for development of energy scenarios. Traditionally, energy-economy models for scenarios have been either top-down, macro-economic models or bottom-up engineering models. Both concepts have their specific strengths and weaknesses. Basically, they focus on different aspects of the energy economy. The ENCI-LowCarb project tried to overcome this by using hybrid energy-economy models that combines both elements. 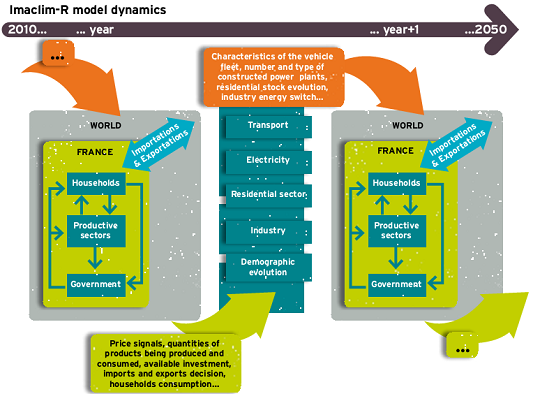 The REMIND-D model, developed at the Potsdam Institute for Climate Impact Research, and the Imaclim-R France model developed by CIRED are hybrid models that integrate a detailed bottom-up energy system into a top-down representation of the macro-economy. Such models are known as hard-linked hybrid models. On the one hand, the choice of this type of modelling tools allowed creating a coherent low carbon pathway including the description of technology developments, economic evolutions, and impacts on the households. On the other hand, these modelling tools are often considered as black boxes, due to their complex nature. It was so very important to address this potential challenge with a transparent communication on the potentials and limits of the models and transparent access to modelling parameters (cost assumptions, potentials etc.). In Chapter 4 are further descriptions of the two models and a comparison of them. While the two models used were both hard-linked hybrid models, combining a macro-economic module and energy system modules, they were in many ways different. At the end of this description is a comparison of the main features of the two models. The model used for the German scenarios by the ENCI-LowCarb project partners is the REMIND-D model (Refined Model of Investment and Technological Development - Deutschland). The model was developed at the Potsdam Institute for Climate Impact Research for this project based on the global REMIND-R model. The macro-economic module is a neoclassical growth model based on a production function. GDP is produced by aggregating the production factors capital, labour and energy. The production factor “energy” is subdivided into the final energy demands of the industry and of the residential & service sector, as well as the energy service demand of the transport sector. The model maximizes the welfare, i.e. the inter-temporal sum of logarithmic per capita consumption. CO2 emission reductions are enforced with an emission budget over the optimization period. Constraints, including emission budgets, always lead to net mitigation costs in optimization models. These are expressed in the model output as discounted GDP losses over the scenario period. Thus, with this model, scenarios with forced emission reductions will always result in net cost. Figure: Overview of the REMIND-D model with physical and monetary flows. Source: Schmid, Bauer & Knopf, 2012 (http://www.feem.it/ ). The energy system module in REMIND-D converts primary to secondary and final energies, as well as energy services in the transport sector. It includes for example power plants that convert coal or solar radiation to electricity, which is demanded by the macroeconomic module. Inputs include renewable energy potentials, price forecasts for fossil fuels, investment costs, and operating costs as well as efficiencies of energy conversion technologies and of transport vehicles. The model has an advanced transport module that converts transport demands for persons and goods into final energy demands with information of present and future vehicles for individual and collective transport. In this was transportation becomes the output of the model's combined energy and transport systems. For the stationary sectors the model use final energy as the ”product” of the energy system. The model is a one region model, covering Germany. With the input data used, the model's baseline scenarios will lead to about 40% CO2 reductions in 2050 relative to 1990. The 40% was chosen as this is roughly the emission reduction that can be expected to take place based on today’s measures. The baseline scenarios are only used to determine the GDP losses of the mitigation policy scenarios as compared to the baseline, in order to understand the differential impact of ambitious mitigation targets. For the scenarios for France, the partners in the ENCI-LowCarb project used the Imaclim-R France model developed at CIRED. It is a dynamic, hybrid-model with 15 sectors. It simulates the economic impact of changes, which occur in the energy sector both in the macro- economic level (change in energy policies, climate policies or loss of competitiveness) and the micro-economic level (weight of energy in the structure of production costs or in households’ expenditures). Like any conventional general equilibrium model, Imaclim-R France provides a consistent macro-economic framework to assess the energy-economy relationship. It is based on a description of the economy both in monetary terms and in physical quantities, linked by a price vector. This dual vision of the economy is included to guarantee that the projected economy is supported by a realistic technical background and, conversely, that any projected technical system corresponds to realistic economic flows and consistent sets of relative prices. The model allows the incorporation of technological information coming from bottom-up models and experts’ judgement. It can handle a number of different proposals for policy measures. A policy measure can be a CO2 tax that increases the price of fossil fuels and that is re-injected in the economy to reduce costs of energy efficiency, or it can be a building renovation programme that reduces heat consumption over time. The model relies on recursive architecture (see graph) with exchange of information between a macro-economic module and several dynamic sectoral modules. For each year, the macro-economic module in the model establishes equilibrium of the economy and of the energy flows described. The markets have fixed equipment stocks and fixed intensity of labour, energy and other intermediary inputs, but have flexible utilization rates. The market’s equilibrium gives information of the levels of production, consumption, international exchanges, investments, relative prices, and profitability rates of sectors. It gives a snapshot of the economy, year by year, in monetary terms (in currency) and in physical quantities (unit: Mtoe) for energy. The dynamic modules describe demography, capital dynamics, and sectors with bottom-up technical descriptions. The sector modules take into account the economic values of the previous static equilibrium, assess the reaction of the technical systems and send back this information to the macro-economic module in the form of revised descriptions of the sectors (new input-output coefficients). Each year, technical choices are flexible but they modify only at the margin the input-output coefficients and labour productivity of the next year. This gives a “clay-putty” description of the world, where parameters gradually develop over time. Figure: The recursive structure of the Imaclim-R France model, linking the main modules of the model in the evolution from one year to the next. With the recursive structure, the model is well adapted to describe large departures from the reference equilibrium, which a radical low-carbon transition can be. The model does not have a global, inter-temporal production function, and does not produce inter-temporally optimized scenarios. 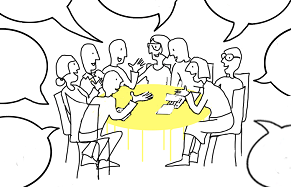 Instead the scenarios describe a development resulting from decisions made with the information that is available at the time of each decision. With this structure the baseline scenario does not represent an inter-temporal optimisation. Therefore the policy measures can lead to economic gains, if they increase investments that are cost-effective over their lifetime. This can happen if the measures give decision-makers signals that lead them to choose more cost-effective investments. An example of this is a CO2-tax that increases the energy costs for the decision-makers leading to increased investments in energy efficiency, and later years an increase in energy costs that will make energy efficiency investments more cost-effective over their lifetime. With the policy measures approach and the recursive structure, the resulting Imaclim-R France scenarios might not meet an emission reduction target, but if a target is not met, a new scenario with more and/or stronger policy measures can be made. This process can continue until the agreed target is met. The model includes a number of constraints, with the capacity-restriction of production as probably the most important, because of inertia. Investments in capacity can only increase production capacity in the given sector in the following year. An example of another constraint is a travel-time budget that limits the personal travel time, based on the empirical finding that there is a constant average travel time over decades. Fundamentally, the REMIND-D's macro-economic module is a neoclassical optimal growth model with energy added as a third production factor in addition to capital and labour as input to the production function. The Imaclim-R France, on the other hand, does not have a global, inter-temporal production function, but use a recursive structure, where for each year the annual static equilibrium is optimised and the step from one year to the next is made with dynamic modules, including sector-specific technology descriptions that assess the reactions of technical systems (such as investments) and send back this information to the static module in the form of new input-output coefficients to calculate the static equilibrium at the next year. With this fundamental difference the REMIND-D can find the welfare-optimal path over a long period of time (it optimises inter-temporally) while the Imaclim-R France can mimic the behaviour of decision-makers that make sequential decisions based on information from the current year while the resulting scenario will not be inter-temporally optimised. To develop a scenario for a low-carbon transition, REMIND-D can run with the constraint of a CO2 emission budget, while the Imaclim-R France was run with representations of policy measures that change the economic and physical conditions in order to reduce emissions over time. Examples of policy measures can be a CO2 tax that increase the price of fossil fuels and that is re-injected in the economy to reduce costs of energy efficiency, or it can be a building renovation programme that reduces heat consumption over time. With the emission budget constraint, the resulting REMIND-D scenarios will always stay within the emission limit, but the economic loss can be large. 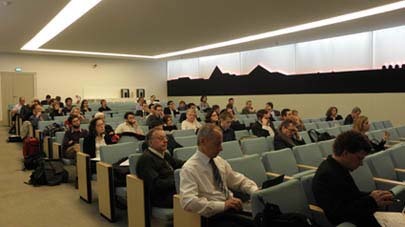 With the policy measure approach and the recursive structure, the resulting Imaclim-R France scenarios might not meet the emission reduction target, but the policy measure can lead to economic gains, if they increase investments that are cost-effective over their lifetime, or they can lead to losses if climate policies hinder growth. If the target is not met, a new scenario with more and/or stronger policy measures can be made, a process than can continue until the target is met. Thus the REMIND-D can describe the welfare-optimal scenario within the given constraints while the Imaclim-R France can describe the scenario that is the result of sequential decisions made with the information that is available at the time of each decision. REMIND-D basically has two sectors: households and firms, while Imaclim-R France has 15 sectors including households, the government, and several production sectors. The Imaclim-R France model develop the power sector by choosing the combination of base-load, intermediate-load and peak-load plants, following a load-duration curve, choosing between nuclear and fossil fuel power plants, while the development of the renewable electricity is exogenously given and influenced by the existing feed-in tariffs. The REMIND-D model optimises the development within all allowed options, including renewable energy. The inertia to change the physical infrastructure is represented in the Imaclim-R France model by allowing only limited changes of the technical systems from year to year while the REMIND-D model use adjustments costs that are added to fast changes in technology. Both result in scenarios with gradual changes rather than unrealistic flip-flop behaviour. The Imaclim-R France has a number of other features, such as a travel-time budget that limits the daily travel time and thereby the possible modal shift in passenger transport. While some changes can have little influence on the scenarios, such as the way inertia in the technical infrastructure is represented, the basic difference between the inter-temporal optimisation and the optimisation year by year gives the main difference in characteristics of the models. - Scientific Reports on the models of Imaclim-R - France and the REMIND-D. Download from: Reports, Posters, Fact Sheets or from Reports at www.enci-lowcarb.eu . Collaborative Scenario Creation Processes for Germany and France.